Left 4 dead 2 is an extremely interesting video game that had me glued to the screen for hours on end and kept me highly entertained for the whole time. Its graphical content is superb and the games story is very easy to follow and quite challenging in its own right which makes it a much better game. 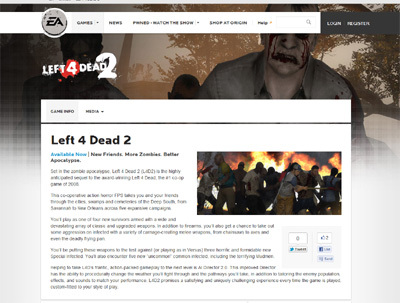 We have also compiled a Review System for this, of which Left 4 dead 2 is Rated as Five Stars, the highest possible score available from the Game Review Team.